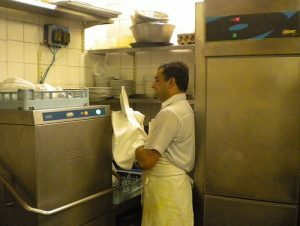 Punjabi Pakistani man working as a dishwasher in a restaurant. Sunday, April 28, 2019, 3:00 – 4:00 p.m., and two other Sundays. The great recession started in 2008. How have people fared in the recovery, now that 10 years have passed? Join us for a series of informative videos and challenging discussions on Escalating Inequality. The sessions will occur Sundays, April 28, May 5, and May 19, 3—4 p.m. in the Heritage Room. Questions? Contact Rebecca Pace, 513-231-9641.